It’s a paper Reindeer party! I have included a pdf file for download, plus free cutting files for most die cut machines. 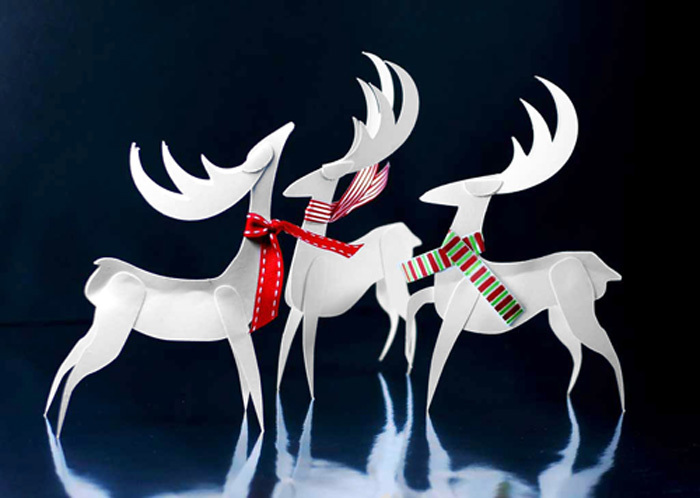 These paper reindeer look lovely as a table decoration, or you can just poke a hole, add some string and have a paper Christmas ornament for your tree. All you have to do is cut the deer parts out of card stock, glue together using tacky glue, and add a festive ribbon around the deer’s neck. Just watch that you don’t stick the bottom of the reindeer’s body together. You have to be able to spread that section open so that the deer can stand. Hope you enjoy this very easy to make paper reindeer Christmas Ornament.